When you think of kids summer camps you think of fun activities. It might be a camp out under the stars, splashing into the lake, or weaving your first lanyard? For a camp like Rockbrook, kids have the chance to try new things that they may not get to do at home, such as rock climbing, pottery or horseback riding. All of our camp activities take place in a noncompetitive environment encouraging everyone to do their best all without the added fear of failure. 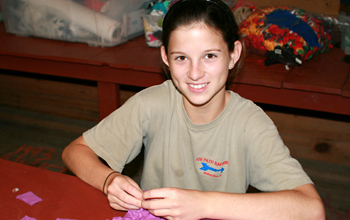 The program is designed to enhance each camper’s sense of self by creating opportunities for success. Kids summer camps offer the chance to stretch limits, while being supported and supervised by well-trained staff. This is a main benefit for kids when they attend summer camp, and it is something we hold central in our philosophy. 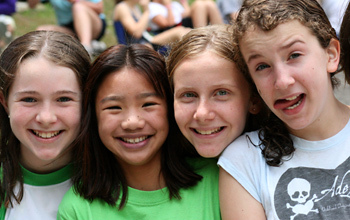 Rockbrook summer camps provide more than 25 different activities for kids. They can be divided into four different general categories— Skill-based, Creativity-based, Adventure-based, and Equestrian-related. 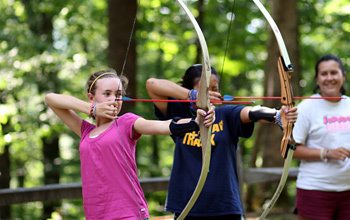 The Skill-based camp activities for kids are things like Archery, Riflery, Gymnastics, Sports (soccer, kickball, softball, basketball, volleyball) Swimming, Yoga and Tennis, for example. The Creativity-based activities include: Drama, Nature Discovery, Dance, Curosty (jewelry making, basket weaving, loom weaving, knitting), Hobby Nook (sewing, leather working, woodcraft), Hodge Podge (tie dying, fabric painting, misc. decorations), Pottery (wheel-thrown, hand-built), and Creative Writing. The Adventure-based kids camp activities range from Backpacking and Day Hiking, to Sea Kayaking, Whitewater Kayaking, Whitewater Rafting and Whitewater Canoeing. There’s also lots of climbing, Alpine Tower Ropes Course Climbing and Rock Climbing. The Equestrian-related activities include mounted riding lessons, equestrian skills, and our stable club. But what if it’s not summer? If you love the activities we have at camp, here’s a list of camp activities you can do at home! Enjoy a little camp spirit all year long!